Every culture has its traditions of chants, spells and lore to help attract love. This is true of the early Celtics, Egyptians, Italians, Hopi Indians, Irish, colonial Americans and much more. Do you believe in mistletoe at Christmas? How about sending Valentine's Cards in February? 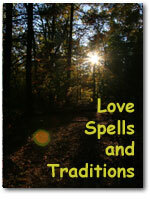 Learn more about the traditions of love, and the spells that were said to attract a lover! Learn about the meaning of roses, what a dream could be telling you, why mistletoe should be kissed beneath, what a girl should do to learn if a guy really loves her, what to do on Halloween, what to do on Christmas morning, and much more! Just what do those symbols on your Valentine's Day Card really stand for? Find out!